Compared to the standard yellow wooden pencils that we all knew and loved back in school, mechanical pencils have many advantages. 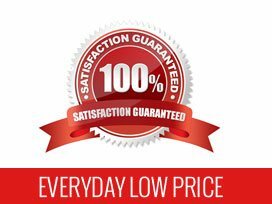 You never have to sharpen them, and you can replace their leads rather than throwing the stubs away, so they're economically and environmentally friendly. 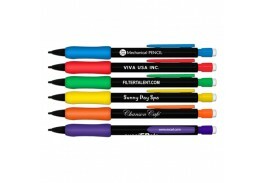 Mechanical pencils also draw consistent lines and have superior balance, which make them a favorite among engineers, artists and other professionals. 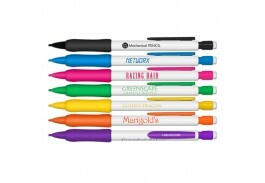 At the Promotional Pen Store, we specialize in pen branding, but we also offer promotional mechanical pencils that make great gifts if your business or organization caters to the types of people who love to use mechanical pencils. 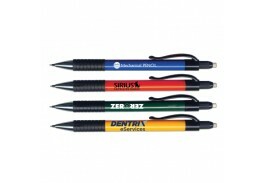 We offer customized mechanical with trim colors ranging from basic black to orange, yellow and green. Erasers are included for cleaning up mistakes. 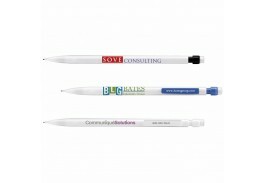 To make each pencil uniquely your own, you can customize it with your logo and message, choosing from dozens of fonts and font colors. Many of our mechanical pencils come with rubber grips that make them more comfortable to use - a feature that will be particularly appreciated by professionals who use these instruments during long days at the office. 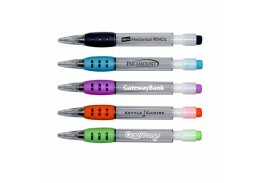 None of our personalized mechanical pencils costs more than a dollar, which makes them thoughtful but inexpensive gifts to reward customers, employees, students and others. 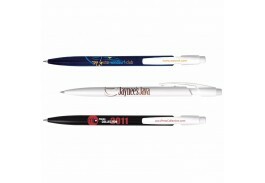 Since mechanical pencils and other writing instruments are frequently shared or given away, this small promotional gift will pay big returns in building your brand over its long life.